Are There Vitamins That Help Vaginal Dryness? Walnuts are packed with nutrients and walnut oil is an excellent way to get even more of the health benefits of walnuts in your diet. They are high in omega-3, fiber, protein and vital minerals including potassium, magnesium and copper, according to California Walnuts. 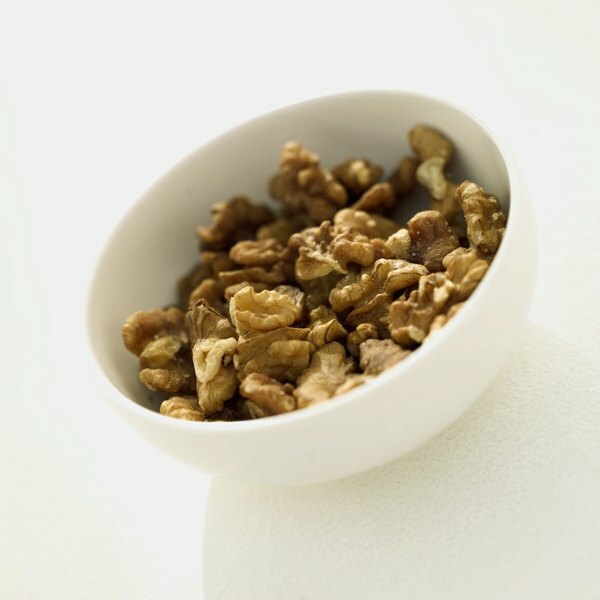 Among the many reasons to enjoy walnuts are the skin benefits of walnut oil, which can be used in cooking and baking, used as a salad dressing or dip, or applied topically, to aid a number of skin conditions. Walnut oil has been recommended to fight wrinkles since at least the seventeenth century, according to “Dangerous Garden: The Quest for Plants to Change Our Lives.” Over the centuries it has gone from being a folk remedy to being supported by science. When eaten, it supports skin thanks to its high levels of essential nutrients. Used topically, it is a rich, non-greasy moisturizer. Walnut oil can be a remedy for fungal infections, such as athlete’s foot and candida. “Women’s Herbs, Women’s Health” notes that it is as effective against candida as over-the-counter pharmaceutical medications. It can be applied topically to the affected area, and can also be mixed with other herbal anti-fungals such as garlic, to enhance its effectiveness. Psoriasis is a painful, persistent skin condition that can be alleviated using walnut oil, according to “Healing with Whole Foods: Asian Traditions and Modern Nutrition.” Add it to your bath to soothe inflammation or apply directly to the affected skin. Walnut oil is an excellent plant source of omega-3, according to the “Vegetarian Journal” and is associated with numerous health benefits including protection against heart disease, some types of cancer, and inflammatory disorders including skin conditions such as eczema. Substitute walnut oil for sunflower oil in cooking, or sprinkle it on vegetables or salads.